Braun On Cover Of Lighting & Sound Magazine! Braun Productions made the cover of the internationally recognized Lighting & Sound Magazine this month. 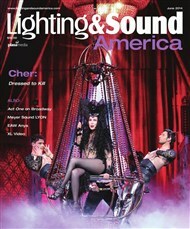 The cover features the custom aerial chandelier made for Cher. The new chandelier is featured in Cher’s current “Dress To Kill” tour. Dressed to Kill Tour is the eighth solo concert tour by American singer Cher. Launched in support of her twenty-fifth studio album, Closer to the Truth, the tour began in Phoenix, Arizona on March 22, 2014 and will continue across North America before coming to a close in October 2014. The tour has received mostly positive reception from critics, who praised Cher’s vocal ability as well as the several costumes and show elements. This entry was posted on July 8, 2014 by Eric Braun.